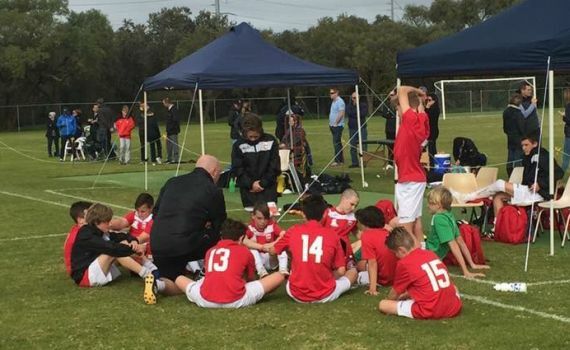 Second half goals from Harry Fletcher and Massimo Bresciani won the game for the ECU youngsters and they go on to Cup final against Perth Glory in the final at Wanneroo City’s ground on Saturday 13th August at 9.45am. ECU started well and had a good chance when the lightning quick Cody Psaila was sent through but he shot straight at the keeper. Melville had the better of the first half in terms of possession but only threatened from distance as the back four of Euan Blair, Aiden Coyne, Ben Ford and Louie Inzalaco stood firm to protect keeper Sam Reilly’s goal. Melville had two free-kicks that went close after silly fouls were given away near to the goal but Reilly saved well. The second half started well for ECU as a break from inside his own half from Psaila after a move consisting of eight passes started which started from Keeper Reilly, saw him go past three players before crossing an inch perfect cross into the path of Harry Fletcher who netted with aplomb from the edge of the six yard box. The diminutive striker who showed plenty of fight and spirit through the game was playing despite knee and ankle problems but led the line superbly. ECU then settled and were the better side creating some good chances for Seb Gomez (after a great one touch move on the edge of the box), Psaila who narrowly shot wide and Massimo Bresciani. ECU’s midfield of Spencer Patten, Liam Silsby, Gomez and Captain Jake Turner took control of the game and were dictating possession. However 10 minutes into the second half ECU were dealt a blow when Captain and leader Jake ‘Michu’ Turner was forced off the field with a bad hamstring injury that will unfortunately keep him out few a few weeks. This was the second injury for ECU after pacey winger Saul Morrissey was forced off with a Quad strain 10 minutes into the first half. This forced a reorganisation with Fraser Houghton coming into the midfield and he was superb. Melville created the odd chance, again from distance but the match was sealed after another break down the right from Psaila and a cross to Bresciani who took a touch to steady himself before unleashing an unstoppable shot into the back of the net to make it 2-0 with 8 minutes to go. The ECU boys saw out the rest of the game without any problems.